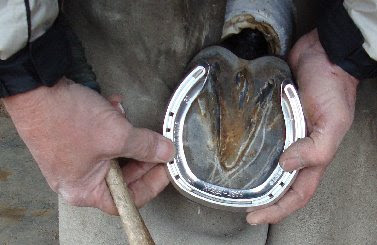 Beginning in 2009, Farrier Product Distribution (FPD) of Shelbyville, Kentucky will assume exclusive import and distribution rights of the popular Kerckhaert horseshoes and raceplates in North America. Steel and aluminum shoes made by the Kerckhaert Horseshoe Company, based in The Netherlands, have been sold by FPD for many years but will now be distributed exclusively from FPD’s Kentucky warehouse. The shoes are sold in farrier supply stores throughout North America. A letter signed by Rudy, Michiel and Martin Kerckhaert was sent to store owners last week, notifying them of the change to a single importer for the shoes. Kerckhaert has manufactured horseshoes since 1906, but the shoes have only been widely sold in North America since the mid-1980s. Kerckhaert steel shoes back then were turned, rather than drop-forged like most American keg shoes, and were (to the best of my knowledge) the first clipped shoes sold here. Kerckhaert now makes both turned and drop-forged shoes, according to Dan Burke, president of FPD. In recent years, Kerckhaert expanded its aluminum racing shoes with the addition of Fast Break XT, Synergy XT and other designs developed to enhance breakover and/or minimize stress on the upper limb. Kerckhaert can claim that three of the biggest races of 2008 were won by horses wearing their shoes on three different surfaces: Ravens Pass wore Kerckhaert race plates when he won the Breeders Cup Classic at Santa Anita in October 2008 on the new Pro Ride synthetic surface there. On grass, the great French filly Zarkava wore Kerckhaert plates when she won the Prix de l'Arc de Triomphe on turf in Paris in October, and WinStar Farms' Colonel John wore Kerckhaert plates when winning the Travers Stakes on dirt at Saratoga in August. FPD President Dan Burke will represent his company at the 2008 American Association of Equine Practitioners Convention in San Diego, California December 6-11. Visit FPD in Booth 1635. For our non-USA readers: Today is Thanksgiving Day in the USA. The traditional meal stars a roast turkey. And that's just the beginning. If the conversation lags around the dinner table today, pick up a drumstick and say nonchalently, "They used to shoe turkeys, you know." All eyes will turn to you. In-laws will be impressed. Children will hold you in high esteem. Any corgis and border collies lying under the table waiting for a handout will say, "Oh yes, I remember my ancestors telling this tale..."
And the carving above, from a medieval church, proves it, even though that is a goose carved into a misericord, a sort of jump-seat ledge in church pews. (I highly recommend following the link to Giles Watson's site. A wealth of information about these relief carvings has been documented and Giles' photos are fantastic.) 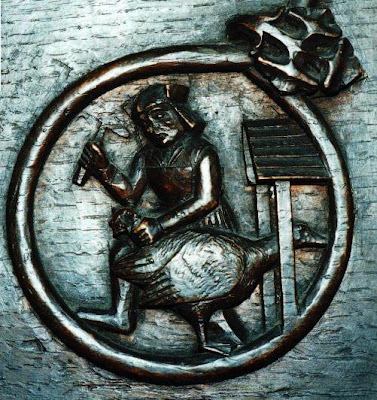 Double-click on the photo to enlarge it; the goose looks to be stabilized in a stocks and the farrier is hammering on its webbed foot. Before railroads, the only way for turkeys and geese to get to market was for them to be herded along country roads to city markets. Drovers would purchase or consign them from multiple farmers and move great flocks toward the cities so they could be sold for Thanksgiving or Christmas dinners. You would hear the poultry flocks, and see the dust clouds, long before they passed through your town. The poultry could eat among the stubble of harvested fields as Thanksgiving approached. The drover didn't hurry them too much, since fatter birds meant higher prices for him. New England writers like Hawthorne and Emerson wrote complaining comments about the huge flocks of turkeys clogging up the roads and impeding the post or the stagecoach. The problem was that the birds' feet and claws weren't cut out to march a few hundred miles. Turkeys were famous for just refusing to move, or they would roost up in trees and not come down. Geese apparently were much more lame than turkeys because of their webbed feet. Cattle, too, had a hard time marching to market, and were often shod along the way. In fact, farriers were in great demand to accompany drovers so that the cattle could be shod or attended to as needed along the route. Even pigs and sheep and goats had to be shod occasionally, although pigs preferred woolen socks with a leather sole. The drover's wagon followed slowly behind the drover, who was often on foot, and his dogs. The wagon picked up strays, or sick or lame birds. They stopped at drovers' inns, and pastured stock in rented or loaned fields overnight. I don't know how the geese were shod in Europe, but I have read that is was some crafty New Englanders who figured out a simpler way to do it. They developed a series of pits along the route. In the first pit was warm tar; the turkeys and geese were herded into the pen and left for a bit, then moved to the second pen, which was sand. The sand, of course, stuck to the tar and made a gritty set of galoshes for the birds. About the time the tar wore off, they would arrive at the next set of pits. It gives a new twist to the expression, "tarred and feathered", not to mention a "turkey trot". In New England, all turkey roads led to Brighton, Massachusetts, which was home to the largest stockyards in America until the railroads (and a Clinton, Massachusetts butcher named Gustavus Swift) made Chicago possible. The 60-acre stockyard started as a slaughterhouse to provide meat for Washington's Army, which was camped nearby during the Revolution. By the Civil War era, the stockyards were surrounded by 61 slaughterhouses and drovers came to Boston from as far as Ohio. If you go to Brighton, you can still see the huge industrial plate drains in the streets along the Charles River where the stockyards stood. They were not draining just rainwater into that river. Brighton was the end of the road for the sore-footed turkeys. 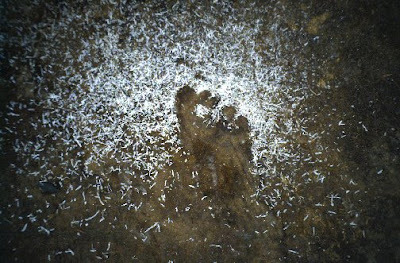 And it may explain why we don't eat their feet. And shoe your grandma’s goose. And chortle for to see. ‘Tis a sign that you are failing. Than shoe my grandma’s goose." Happy Thanksgiving! I'm very thankful for the people who read this blog and support Hoofcare Publishing and are my friends, even if we have never met. Thank you, most of all, for helping the horses. 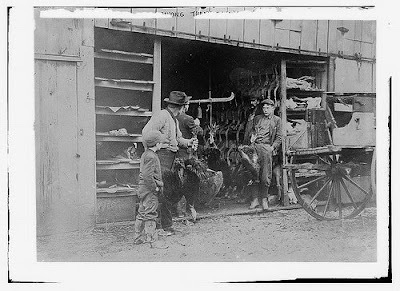 Buying the Thanksgiving turkey, circa 1910; double-click to enlarge and see detail. Library of Congress image. One of the challenges to the paradigm of the wild horse foot as a model for domestic horses has been the criticism that most studies have been done on horses running on arid terrain in the US west. Skeptics have pointed to the platter feet of sand dune horses on the east coast of the USA and variations in herds like the Sable Island ponies that have been limited in genetic input. Dr. Chris Pollitt was scratching his beard over that one when he launched his Wild Horse Research Project at the University of Queensland in Australia last year. Would it be enough to study generic brumby hooves in the wilds of Queensland? Or would he need to hoof it further afield? For the past six months, Pollitt and his lead researcher, hoof science PhD candidate Brian Hampson, have indeed been hoofing it, to the wilds of the far Australian outback. “There is currently no evidence that horses’ feet can adapt to suit the terrain they are moving over. If the foot type of the feral horse can change by changing the substrate, then domestic horse’s feet, too, can be presumed to respond to a change in environment. We will demonstrate that sub-optimal foot conformation can be rehabilitated by movement over the right terrain. “It has been confirmed during the first 12 months of this project that feral horses living on soft sandy country have long and often splayed hooves. Feral horses living on hard rocky country have short, rolled hooves. We will swap six horses from each of these environments for six months to test the effect of the environment on the foot type," he writes. He continues: “It is hypothesized that the foot type of the subject horses will switch from the sand model to rocky model and vice versa. We hypothesize that it is the environment that shapes the horse’s foot rather than predetermined genetic factors. It is currently believed that certain breed types are predisposed to certain foot types. By exposing the same horse to two different substrate conditions, the breed factor will be controlled. Pollitt and Hampson plan to pen an important publication from the study; the results will be presented at scientific conferences in Australia and the USA, and publicized to farriers and horse people during an Australian tour. You know there had to be some drama and poetry in this study, as you will find if you look beneath the surface of most of Dr. Pollitt’s research. In this case, Pollitt and Hampson will saddle up and ride into the back country. No helicopters for them! 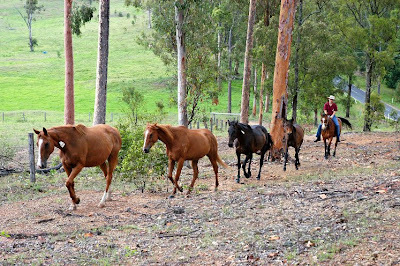 They will not only capture their chosen brumbies, but gentle them and then lead them out of the bush. The chosen environments are the sandy beaches of the Gulf of Carpentaria on the north coast of Queensland, and the rocky desert of Central Australia, 400km southwest of Alice Springs, if you have a map handy. Both locations have feral horse populations in excess of 10,000 horses and have been well studied by Pollitt’s team. Horses will wear a GPS tracking collar for the six months of their release and a VHF beacon for relocation. Horses' feet will be photographed, radiographed, and their loading pressures and pattern will be assessed using an RS scan pressure plate, both before and after the swap. They will also measure hoof wall growth rate over the six month release period. The Australian Wild Horse Research Project is unique in that the researchers include not only scientists and students but private citizens who are interested in wild horses or hoof physiology. Donors to the projects are eligible for consideration as mates on the trail, presuming you can brew a decent Billy Tea and waltz beside the billabong. Australia has more wild horses than any other place on earth; in excess of 500,000 horses roam freely, according to Hampson, but he notes that they are subject to periodic sustained drought and culls by "government bodies and private graziers". Visit wildhorseresearch.com for more information about how you can support the research…or possibly be part of it. We will all certainly benefit from this Outback experiment. PS I thought this post would be appropriate since today is the premiere of the film Australia in the USA. © Fran Jurga and Hoofcare Publishing for the Wild Horse Research Project and Dr. Chris Pollitt. No use without permission. Permissions for use elsewhere can be arranged. Philanthropists John K. and Marianne Castle are the 2008 recipients of the American Association of Equine Practitioners’ George Stubbs Award, an honor that recognizes contributions made to equine veterinary medicine by individuals other than veterinarians. The AAEP will present the award on December 9 during the association’s 54th Annual Convention in San Diego, California. Laminitis had a devastating effect on the Castle family when their beloved Appaloosa, Spot, began to suffer recurrent bouts of laminitis and crippling chronic founder. Mr. and Mrs. Castle worked with a team of respected AAEP members, led by Dr. James Orsini, and then-farrier Rob Sigafoos at the University of Pennsylvania’s New Bolton Center to test innovative treatment techniques while maintaining Spot’s quality of life. Their total dedication to the quality of life of their horse led the treatment team at the New Bolton Center to new levels of inspired care. 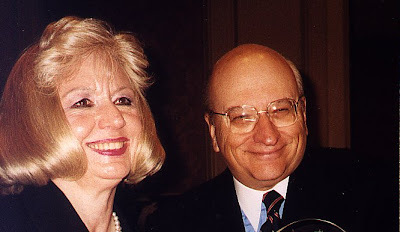 In 2007, Mr. and Mrs. Castle announced a gift of $1 million to support the establishment of the Laminitis Institute, an international laminitis research initiative at the University of Pennsylvania’s School of Veterinary Medicine. Mr. and Mrs. Castle are well-known to many readers of Hoofcare and Lameness Journal and have forged a lasting bond with the farrier/vet community around the world through their sponsorship of the International Equine Conference on Laminitis and Diseases of the Foot, held bi-annually in West Palm Beach, Florida. They play an active role in the scientific, practical and social aspects of the popular conference. In honor of their contributions to equine medicine, the third edition of the Dr. Tom Divers and Dr. Jim Orsini book, Equine Emergencies: Treatment and Procedures, is dedicated to the Castles. Mr. and Mrs. Castle will travel from their home in New York to receive the AAEP award and, no doubt, share their enthusiasm for the ongoing campaign to resolve the mystery of the disease that affected their beloved horse and continues to challenge researchers, practitioners, farrier, trainers and owners. About the award: The Stubbs Award is named for George Stubbs (1724 – 1806), the artist and teacher who played a vital role in veterinary education. His reference book, Anatomy of the Horse, published more than 200 years ago, is still universally recognized as an authoritative equine anatomical depiction. © Fran Jurga and Hoofcare Publishing. No use without permission. British farrier David Gulley, FWCF has been elected President of the European Federation of Farriers Associations (EFFA). The appointment was made at EFFA’s Annual General Meeting in Saumur, France on 15 November, and is for a period of two years. David Gulley’s appointment recognizes his many years experience as a farrier, both in the British Army and in civilian life, his contributions to training apprentices, to competing and to judging competitions, and to supporting the work of the National Association of Farriers, Blacksmiths and Agricultural Engineers. He lives near Melton Mowbray, in the foxhunting countryside of Leicestershire and has visited the United States frequently in the past, to compete and give clinics. David is a Fellow of the Worshipful Company of Farriers, the highest professional achievement level honor in the British farriery system, and perhaps the most difficult credential in the farrier world to obtain. David was delighted with his election to this prestigious and influential position, and has made clear his determination to carry forward and to publicize EFFA’s work in raising standards of farriery throughout Europe. About EFFA: The mission of EFFA is to improve the welfare of the horse by encouraging the highest standards of trimming and shoeing. It has produced agreed standards of basic competence in farriery, and has started a process of accrediting the training and examination systems in member nations against these standards. Farriers who are recognized as meeting these standards will be entitled to call themselves Certified Euro-Farriers. In addition, EFFA organizes a European Farriery Championship every two years, and in alternate years arranges an educational event for farriery students and teachers. Membership of EFFA is open to all farriery associations in all European nations, whether they are members of the EU or not. Current member nations are: Sweden, Finland, Denmark, Germany, France, Austria, Norway, Switzerland, Great Britain, Iceland, Ireland, Holland, Spain, Hungary and the Czech Republic. © Fran Jurga and Hoofcare Publishing. No use without permission. Permissions for use elsewhere are mostoften easily arranged. Fran Jurga's Hoof Blog is a between-issues news service for subscribers to Hoofcare and Lameness Journal. This blog may be read online at the blog page, checked via RSS feed, or received via a digest-type email (requires signup in box at top right of blog page). To subscribe to Hoofcare and Lameness (the journal), please visit the main site, www.hoofcare.com, where many educational products and media related to equine lameness and hoof science can be found. Questions or problems with this blog? Send email to blog@hoofcare.com. News comes and go. Horses come and go. Every once in a while a story or a horse comes back into the headlines and you say, "I'll be darned..."
Last winter we reported on the jubilation of the veterinary community over the success of the jump racer Knowhere, who came back from tendon surgery to excel again at this most grueling of tests for a front tendon. Knowhere kept running, kept jumping and often, kept winning. I lost track of him after he fell at a fence in the Cheltenham Gold Cup last March, and thought he'd been retired. But another racing season has just begun in England and a few weeks ago, Knowhere launched into his 2008 campaign...as a ten-year-old. He came home first in the Old Roan Chase at Aintree, near Liverpool, five years after bowing and having stem cells from his sternum inserted into the bulging superficial flexor tendon of his right front leg. The technique used for Knowhere, called VetCell, is different from the normal fat-derived stem cell treatment. Click here to go back and read about Knowhere's treatment and all the people who will be cheering for him next Saturday in the Hennessy Gold Cup. His tendon will have to hold up over a distance of 3 miles, 2 and a half furlongs and carry him over 21 fences. The race is the oldest commercially sponsored sporting event in Europe, and Knowhere, who is trained by Nigel Twiston-Davies and ridden by Paddy Brennan, will face 53 others if they all are fit to run. There may be plenty of horses racing with bionic parts! Or, "the qualitative effect of addition and subtraction of a wedge heel on dynamic landing pattern at the trot (up)...."
I saw this photo in Horse and Hound and had a good laugh. There was no caption, no explanation of whose leg and shoe that was. Intrigued, I ripped out the photo and let it flutter around on my dashboard for a few days while I drove to a conference. I laughed every time I saw it. Finally, today, I found out the rest of the story. It's a about a woman named Claire...who can't stride out at all. Claire Lomas is a ****event rider who was badly injured in a fall. She injured her spine (in addition to just about everything else) and, as she so understatedly says, "can't walk, at the mo". But her friends still can. One of the riders at Weston Park horse trials last month hatched a plan to turn the trot-up and vet inspection into a mini-fundraiser to help Claire with her medical bills. Everyone chipped in to egg him (yes, him) on and his plan became more and more outrageous. As did his hair and his outfit...and, finally, his shoes. When the time came, the fellow literally did have to trot his horse, which meant he had to run in five-inch Lucite high heels. Luckily Martha from Equestrian Services Thorney was on hand to capture it with her camera. This guy's still raking it in and the photo of his best-shod foot is traveling around the world, thanks to Horse and Hound and the Hoof Blog. A donation from the Hoof Blog was made today through Martha to the Claire Lomas Fund so that we could make you laugh this morning. Read more about Claire and her plans to walk again at www.get-claire-walking.co.uk. © Fran Jurga and Hoofcare Publishing. No use without permission. If you would like to use the photo, I am sure that Martha at EST would arrange a donation to Claire's fund for you, too. 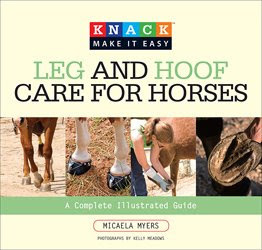 Hot off the presses this week is "Leg and Hoof Care for Horses" by Micaela Myers, former editorial staffer at Bowtie Press in California. 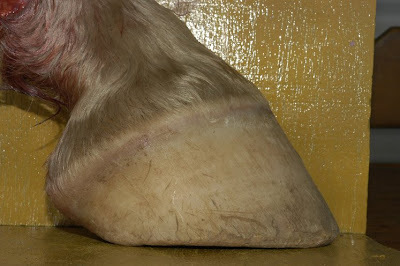 Micaela has done a great job of compiling information about almost every imaginable disorder of a horse's hoof or leg. Maybe readers of Hoofare and Lameness Journal and this Hoof Blog don't think they need this book, but most horse owners surely do. The reason? We have lots and lots of books on the foot and on lameness that explain every disorder and treatment but this book takes the novel approach of spreading information and photos about each problem over two pages, showing the problem in nice color photos and adding colorful boxes with notes. This means that if an owner or junior rider or a parent needs to understand what stem cell therapy for a tendon injury is, or what ringbone is, they can just open up the book and voila! there it is. No looking things up in three different chapters. No footnotes. And there's that aha! moment of "Oh my gosh, that is just what Moose's leg looks like!" Never underestimate the value of the simple approach. Or big, colorful photos. As I flipped through this book, I was reminded of a quote I read earlier today, something to the effect of "If you can't explain your subject in a few simple words, then you probably don't really understand it yourself." Also on the plus side, Micaela Myers dances like a prima ballerina around the subject of whether horses should be shod or not. Like everything else in the book, it gets two pages. She does differentiate between normal and therapeutic shoes, and she does include photos of Natural Balance and AANHCP (Jaime Jackson) trims, and discusses Strasser hoofcare briefly. On the down side, the book is inconsistent in the quality of photos and their labeling. Many photos are nicely enhanced with arrows and callout text, not always pointing to the right thing. Some photos would only confuse an owner, such as a photo showing the bottom of a foot with a bar shoe and pad to illustrate a keratoma. The book really shines in the veterinary sections more than the hoof sections. The radiographs are big and sharp. The section on how to sweat a leg with DMSO and plastic wrap could help a lot of people stay out of trouble; seeing the sweat section next to the poultice section helps people understand the difference between these two leg wrapping treatments. The feet in the photos are pretty average, and the shod ones are not wearing notable, fashionable or even clipped shoes, usually. They appear to be normal horses of the Quarter horse persuasion, which is pretty much what most American horses would look like. There is virtually nothing on racing or even sport- or breed-specific problems. We live in an age where few people are going to sit down and read a book unless they have to. For a book to earn its place on a shelf, it has to be a tool with a specific job to do. Micaela Myers has given us a book that can point you to a photo and detailed explanation of an annular ligament injury or a capped elbow in five seconds or less. The other great quality of this book is its price: just $25. It's a great price for such a thick, colorful book. It's a nice bright package, but we all know better than to judge a book by its cover. Use this book as an asset to keep next to your more serious, in-depth library of lameness books. Don't loan out those icons--Denoix, Pollitt, Van Nassau, Clayton, Dyson--but offer Myers instead. Be generous: It's a book anyone can understand, navigate, appreciate...and afford to replace. Ordering details: $25 plus $6 post in USA, plus $15 air post to other countries. Pay in US dollars. Visa/Mastercard accepted. Allow a few weeks for delivery. Available 18 November 2008. Mail orders to Hoofcare, 19 Harbor Loop, Gloucester MA 01930. Telephone orders to (01) 978 281 3222 (leave details on voice mail); fax orders to (01) 978 283 8775. Click here for fax/mail order form. Email orders to books@hoofcare.com. The results are in and analyzed from a government-run, nationwide survey of the job practices and educational training of Great Britain's barefoot hoof practitioners. Please note that the results of this survey apply only to hoof trimmers residing in Great Britain. Among the conclusions drawn by the government agency "Lantra" is that "barefoot trimmer" isn't a good title and is not accurate in describing the services provided. Lisa Jarvis, Lantra's Industry Parnership Manager for Professions Allied to Veterinary Science (PAVS), said in a press release that the public may be confused about the scope of services provided by a barefoot trimmer, as would a veterinarian seeking to work with a trimmer on the case, according to Jarvis. Jarvis plans to work with trimmers to come up with a better job title. "Equine podiatrist" was a descriptive term mostoften used by the trimmers to describe themselves. • More than half had less than three years of experience; only 7% had been working as trimmers for more than six years. • 89% stated that they believed they held a relevant qualification to do their jobs. As with all surveys, the results compile responses from those who responded, and little is known about those who did not respond. Things get interesting when the trimmers were asked what they did on the job. Trimming feet and assessing environment, soundness, gait analysis, structure and function of hooves, hoof health, and diet/nutrition were listed as job activities by 95% of those surveyed. A similar survey of equine dental technicians found that that field, too, is populated by second-career choosers. The conclusion of the study is that the government should develop standards for both trimmers and equine dental technicians "to allow clear identification of the practical skills and underpinning knowledge required to undertake these roles professionally...other professional and regulatory bodies for veterinary science and farriery should be consulted and involved with the development process". Great Britain is home to an estimated 500 people who are believed to be earning a living by trimming horses' hooves. It's interesting to note that a functional "map" of the farrier profession in Great Britain compiled in 2006 points out the pressures of changing technology in farriery and the need for more training in that area but does not mention the popularity of barefoot trimming and any possible services in that area that farriers might provide, creating an "either/or" situation for horse owners. Consider this: becoming a farrier in Britain requires a four-year apprenticeship, college study, examinations, a considerable investment in tools and inventory, and ongoing compliance with occupational regulations and government doctrines. Entering barefoot trimming requires no training, college or exams, very low initial investment and overhead, and almost no government oversight unless a welfare violation charge is made. That said, many British barefoot trimmers seem interested in continuing education and advancement, perhaps moreso than average farriers, and trimmers must pay tuition for their education out of their own pockets. Read more about how and why the survey was conducted in the Hoof Blog's article from January 2008. © Fran Jurga and Hoofcare Publishing. No use without permission. Permissions for use elsewhere are usually easily arranged. 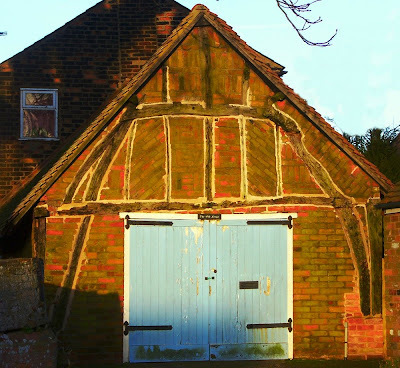 As the sun sets in Buckinghamshire, England, it warms and illuminates centuries of different families of bricks that are working together to hold up a lovely old smithy in the village of Wingrave. How those old timbers are defying gravity is a mystery to me but I am so glad they are resisting what must be a tremendous urge to let down the weight. Everyone who reads this blog knows that I am a sucker for arch-door smithies of the type that proliferated the Irish and British countrysides around the turn of the century. If you squint at this shop, you can see an arch not for the door, but for the entire structure. 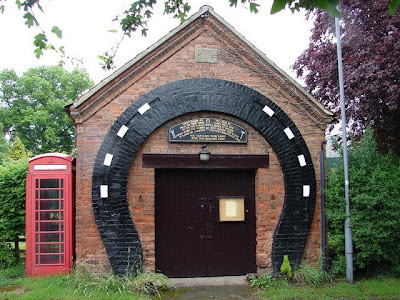 The arch, of course, is the strongest form in nature and in engineering, and the strongest men in the village found ways to incorporate it into their simple workshops. The fact that the arch is mirrored in the horseshoe was a bonus that these self-taught architects just could not resist exploiting! How many people rush by this old building each day without a thought to what its survival means? People will stop and photograph a water wheel or a dovecote or an old weathervane, but old blacksmith shops rarely are worthy of a snap, perhaps because they are so humble and, until you look more closely, non-descript. My guess is that until the wintery sun hit at just this angle, the photographer hadn't paid much attention, either. The sun showed him a warm patchwork quilt, built out of bricks. Thanks to Algo (Alex), for the loan of this beautiful photo. 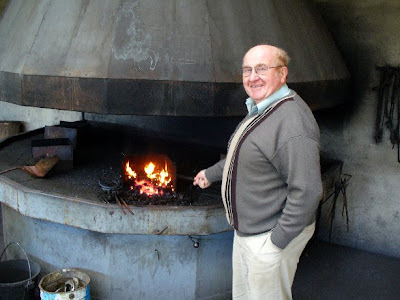 Alex is an extraordinary landscape photographer; his Flickr files are worth a long glance, just like this forge. This post contains an embedded multimedia file and may open slowly. It's worth the wait! At the 2008 American Association of Equine Practitioners Convention in San Diego, attendees will be able to meet German veterinarian and anatomist Christoph von Horst in the Hoofcare and Lameness booth. This will be the first time that equine plastination anatomical models will be shown in North America! The majority of the equine plastination models are of hoof tissue, but you will also see in this slide show a tissue slice from a horse's head. Plastination is a preservation technique. You may have seen or heard about the blockbuster museum exhibit that has been traveling the world, called Body World. Dr. Von Horst is an anatomy specialist who uses the same procedure not to shock the public or create controversy, but to preserve delicate slices of tissue for intense study of equine anatomy. Serendipitously, he has created hauntingly beautiful images and models that cross the line into art. His images of the hoof's laminae were selected for display this summer at the National Museum of Racing in Saratoga Springs, New York. Was it art or was it veterinary science? It looked like a spectacular sunrise coming up not over the curvature of the earth but the curve of the coffin bone! Dr. Von Horst will be bringing some samples of his work in the form of both two- and three-dimensional models for sale. Many of his tissue extractions are cased in lucite for long-term preservation and study. I do not know what he is planning to bring but I know it will be a beautiful display--and turn our booth into a museum! You will be able to purchase examples that are for sale. Be sure to visit www.plastinate.com to learn more about Dr. Von Horst and his work. I know that many of Hoofcare and Lameness's subscribers and friends will be joining us in San Diego for the AAEP convention, beginning December 7th. There is a half day of lameness lectures each day, and a full day of farrier lectures on Wednesday, December 10th. Add those educational opportunities to the prospect of browsing through the largest trade show on earth dedicated to horse health products and services (you really can't see the whole show in one day) and you can see why this event is the one we have been waiting for through all of 2008. Having Dr. von Horst visiting with hoof and anatomy afficianados in our booth each day will be a huge bonus. Over the next three weeks, this blog will be featuring many of the speakers and exhibitors and new products that will be making the trip to San Diego. Just a few of the speakers familiar to Hoofcare and Lameness readers are vet/farrier Dr. Hans Castilijns from Italy, farriers Dave Duckett FWCF and John Suttle, and hoof repair specialist Ian McKinlay. (And that is just the tip of a wonderful iceberg!) We all look forward to seeing you and sharing this great experience with you. Please download and study the AAEP Convention web site's schedule of the veterinary and farrier programs. Click here to preview the trade show, which will be open all day, Sunday through Wednesday. © Fran Jurga and Hoofcare Publishing. All images in this post loaned by HC Biovision and www.plastinate.com. No use without permission. 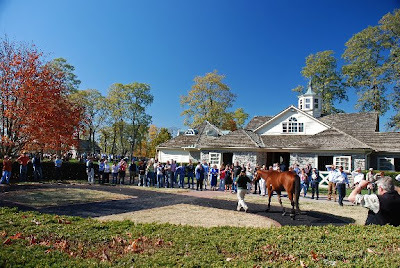 The most famous feet in the horse world touched down on their new Kentucky home last week, as more than 500 guests were on hand for a "Big Brown Bag Lunch" to welcome Kentucky Derby and Preakness winner Big Brown to Three Chimneys Farm in Midway, Kentucky. Big Brown will stand at the elegant farm for a fee of $65.000. The farm was the former home of champions like Seattle Slew and is currently home to Point Given, Smarty Jones, Dynaformer, Sky Mesa and other top Thoroughbreds. A report by Glenye Cain in the Daily Racing Form said that Big Brown's heel bulb injury, which caused his early retirement and withdrawal from the 2008 Breeders Cup, was "filled with soft putty" and that he was wearing a z-bar shoe. Thanks to Jen Roytz, Marketing and Communications Director at Three Chimneys Farm for the loan of these photos which were taken by Gayle Ewadinger of Three Chimneys. Big Brown received a Big Welcome on Wednesday when guests celebrated the Derby winner's return to Kentucky. He will stand at stud at Three Chimneys Farm in Midway. To subscribe to Hoofcare and Lameness (the journal), please visit the main site, www.hoofcare.com, where many educational products and media related to equine lameness and hoof science may also be found. 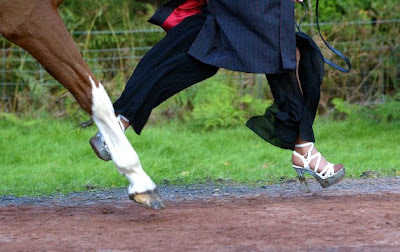 A study of foot balance and lameness in riding school horses has won the Royal Agricultural Society of England‟s "Eqvalan Duo Equine Thesis of the Year Award‟, which celebrated its tenth anniversary this year. The award is sponsored by Merial, manufacturers of the Eqvalan equine wormer. On Friday, before a panel of academic and horse industry authorities, Laura Corbin from Warwickshire College in England reported on her research on riding school horses and described how she developed an objective system to evaluate foot balance. She found that horses with chronic foot conditions often had poor scores for foot balance and proposed that maintaining good foot balance could reduce lameness and provide long term economic benefits. Laura is currently undertaking a studentship with the Roslin Institute and is at the University of Edinburgh in preparation for her PhD. Her winning thesis “Foot Balance and Lameness in Riding School Horses”, was selected from research theses submitted by universities in the United Kingdom and Ireland. Laura competed against four other finalists in a presentation of her study which the judges described as “fascinating and extremely useful information for the industry”. Second prize winner was Charlotte White of Nottingham Trent University for her dissertation: "An investigation into the occlusal secondary dentine thickness in horses of different ages". "Inappropriate foot balance has been implicated as a causative factor in many instances of equine lameness. In this study, the static foot balance of 81 horses at two riding schools was evaluated in order to assess foot balance in relation to lameness. "An objective system was used to assign a foot imbalance score to each horse based on the occurrence of the following foot abnormalities: sheared heels, underrun heels, contracted heels, broken hoof pastern axis, mismatched hoof angles and small feet, as assessed using specific measurements of the foot. "The mean foot imbalance scores were 2.9 (± 1.0) for horses at Riding School A and 2.9 (± 1.2) for horses at Riding School B. (Minimum score = 0; maximum score = 6). "Horses with chronic foot conditions were found to have significantly worse foot balance with respect to the foot abnormalities identified in this study (as indicated by a higher foot imbalance score) than those without. "At one of the riding schools, horses that had been lame within the last year had significantly worse foot balance than other horses in the population. "The results suggested that poor foot balance in riding school horses may contribute to the occurrence of lameness and the development of chronic foot conditions. Maintaining appropriate foot balance in riding school horses may therefore reduce the incidence of lameness and chronic foot conditions and could provide long-term economic benefits. "Further investigations incorporating a greater number riding schools are necessary to confirm the results of this study; prospective studies would be of particular value." 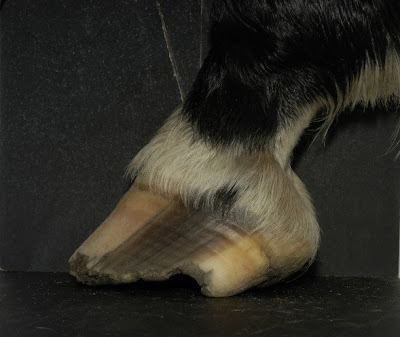 Note: the abstract is a little vague about defining what a chronic foot condition is or how severe or longlasting the lameness conditions were. Hopefully the full paper will disclose a lot more about the methods and presumptions of this study. Congratulations to Laura for bringing the preventive value of good hoof balance to the attention of the public. Warwickshire College is home to one of Britain's leading farrier college programs. © Fran Jurga and Hoofcare Publishing. No use without permission. Permissions for use elsewhere are most often easily arranged. Dr. Orsini, a veterinarian and surgeon at the University of Pennsylvania, is also the Director of the International Equine Conference on Laminitis and Diseases of the Foot, which spawned the Laminitis West Seminar. Dr. Orsini worked on the Laminitis West Seminar in conjunction with Dr. Tim Eastman and Dr. Nora Grenager of Steinbeck Country Equine Clinic in Salinas, California. 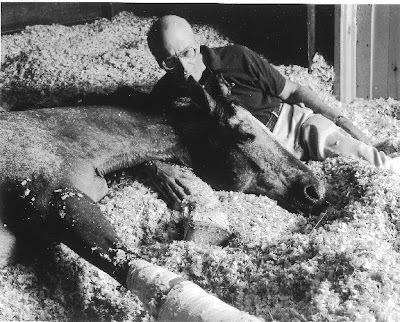 Dr. Eastman served as the Laminitis West Seminar Director. Joining Dr. Orsini as presenters were Dr. Thomas J. Divers of Cornell University and farrier Patrick Reilly of the University of Pennsylvania. The 21 students at the Laminitis West Seminar were from the University of California/Davis. Of these students, two were scholarship recipients that competed for the Laminitis West scholarships. The scholarships were supported by a sponsorship from Merial and administered by Dr. Grenager. The scholarships were awarded to these students with the purpose and obligation of the students to return to their University/School and report on the latest information learned at the meeting. Major sponsors were instrumental in the Seminar’s scope and success. “The support from our sponsors was outstanding and allowed the organizers to put together the highest quality meeting,” said Dr. Orsini. Sponsors included Merial, Sound Technologies, Purina Mills, Nutramax, Soft-Ride, Castle Bay Farm, UPS, Wachovia Dealer Services, Purina Mills, Intervet, Luitpold, Bayer, Platinum Performance, CVS/VET, Victor Medical Company, Pfizer Animal Health and Wedgwood Pharmacy. Sorry, friends, I have been on the road and only today found a way to check email and this was in Thursday's email. It is a press release from Mustad Hoofcare and will be of interest to everyone in the farrier world, quite literally. I am posting this press release in its entirety, as received from the Mustad public relations firm. Companies and individuals with business relationships with the firms who have questions should contact Mustad and/or Delta directly. FOREST LAKE, Minn. – (Nov. 6, 2008) – The Mustad Hoofcare and Delta Horseshoe families are joining forces to create an integrated team dedicated to the hoofcare industry and to the welfare of the horse. Owned by its founding family since 1832, Mustad brings more than 175 years of manufacturing expertise to the newly combined entity, which also will benefit from Delta’s 25-year track record of distribution and brand building proficiency under the direction of the van der Linden family. “We’ve long admired Delta and their reputation for being extremely close to the customer in everything they do, so it’s a great combination for us,” said Carlos A. Xifra, president of Mustad Hoofcare Center. Both leaders said they expect to offer increased value to customers and to the hoofcare market, including a broader mix of products from a single source and simpler, faster delivery coast to coast. There are no immediate changes to personnel or procedures at either company following today’s announcement. It will be “business as usual,” company officials said. On Jan. 1, 2009, Mustad Hoofcare Center and Delta Horseshoe Company will be officially combined into a single operating entity. At that time, more details will be shared about the new organization, including how customers will benefit from expected operating efficiencies and synergies. Both leaders will take on new roles: van der Linden will become the president of the combined organization, and Xifra will become the new horseshoe manufacturing director for the Mustad Hoofcare Group worldwide. The combined organization will continue to operate both locations, in Rocklin, Calif., and Forest Lake, Minn.
Based in Forest Lake, Minn., Mustad Hoofcare Center provides products to satisfy the needs of farriers, horse owners and veterinarians. Mustad Hoofcare Center is comprised of some of the industry’s leading brands, including St. Croix Forge, Capewell, Cooper, Tuff Stuff®, Thrushbuster® and Right Balance™. Based in Rocklin, Calif., Delta Horseshoe Company has been providing quality farrier-related products since 1984. Delta is committed to every aspect of the farrier industry and stays in constant communication with a worldwide network of manufacturers and farriers in order to provide the best and most current products available. It sells its products under a variety of widely recognized brands, including horseshoes, horsenails and tools under the Delta brand. Exclusive to Fran Jurga's Hoof Blog; published November 2, 2008. On Saturday and Sunday, November 8-9, Cornell University's College of Veterinary Medicine will celebrate its 25th annual farrier conference. The college welcomes farriers from all the US and Canada, and provides a first-class setting for a range of speakers and demonstrators. The two "lead" speakers this year are two farrier instructors from Great Britain, Mark Caldwell and Neil Madden. Both have earned the FWCF level of recognition from the Worshipful Company of Farriers and are currently at work as the instructors of the world's first official Bachelor's degree program in farriery. Additional speakers are Steve Kraus and Bruce Matthews, along with Cornell's Dr. John Lowe. On Saturday, Caldwell and Madden will compare video-based gait analysis and sensor-embedded pressure mats to demonstrate hoof balance quantification. Sunday will be a full day of lectures in the high-tech lecture theater. Cornell is located in Ithaca, New York; it is approximately in the center of the state. There is a very good reason why this conference has succeeded and lasted for 25 years: it is simply excellent. Hoofcare and Lameness is proud to be associated with this event. Click here for more information or call 607-253-3200 to speak with Amanda Mott about registration. A full conference brochure can be downloaded from the Cornell web site. Caldwell's lectures can ask as many questions as they answer. Here you see two views of the right front foot a horse brought to him "to be fixed". I've heard Mark Caldwell speak several times and it's hard to say what the audience at Cornell should expect. I remember one video example shown by Caldwell was a time delay over four strides. As the load came over the medial heel, the medial heel became a fulcrum point around which the hoof rotated outward, slightly. Video analysis showed that over the four strides of the two-beat gait, synchronization of the loading feet was delayed by .020 seconds. As we all know, synchronicization is crucial to a horse. Without it, he is likely to forge or interfere, or even stumble. At the very least, the horse falls out of the collected frame. At this point in farrier science, we probably don't know how much variation in timing a horse can compensate. 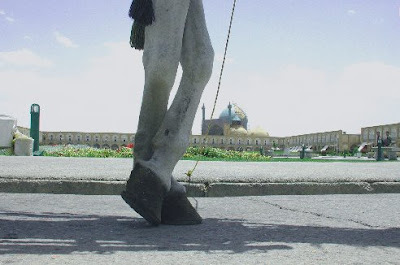 In Caldwell's sample case, by the fourth stride, the horse had to compensate for his imbalance by “hanging” on the left rein while it re-collected itself. With a lot of horses, that's one "long side" of the ring. Horses can get away with a lot and keep trying; it takes an experienced rider (or, sometimes, a bigger arena) to sense what is really going on; a good rider can help a horse. Caldwell's example makes a good case for not evaluating a horse based on a single isolated stride on high-speed video...or even several strides. Even with the best scientific aids, farriery still requires the art of looking at a horse in motion and recognizing rhythm and cadence, before one can even begin to dissect the horse's problem. You just might look in the wrong place. Caldwell talks a lot about the marriage of art and science that is necessary for good farriery. His and Madden's lectures at Cornell this weekend should be a great update for new ways to approach studying the hoof. © Fran Jurga and Hoofcare Publishing. No use without permission. Permissions for use elsewhere are mostoften easily arranged. I have an idea to publish my collection of photos of blacksmith shops, smithies, smiddies and forges but I keep finding photos of ones that I haven't seen yet, so I guess I have to keep traveling for another decade or so. I'd like to have a war room type of map with the location of all the old shoeing shops marked on it. What a lofty goal that is: an architectural treasure hunt! Of equal interest to the ones that survived are the ones that didn't. What has replaced the old blacksmith shops? A busy shop once stood in the middle of Times Square in Manhattan! But as fast as shoeing shops crumble and decay from abandonment or are rehabbed into restaurants and condominiums, clever people are building new ones. Or dressing up the old ones. So we come to this image from the bulging "favorite photos" file. This fine shop is in Gonalston, Nottinghamshire, in Great Britain. As fine as the smithy may be, the phone booth just puts the frosting on the cake. pray on this shoe cast your eye. If it's too strait we'll make it wider. Twill ease the horse and please the rider. you can have them eased with the greatest of care." The photo above is generously loaned by Iain Paterson who adds that he dedicated it to his wife, Jodi, "who is descended from a line of blacksmiths." She must feel right at home. 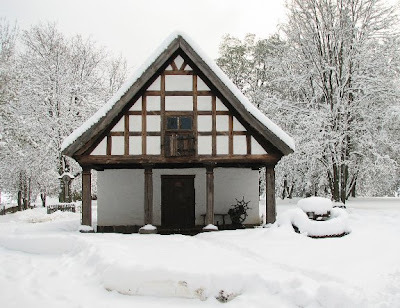 This snowy smithy in Poland has always been on my list of favorites. © Fran Jurga and Hoofcare Publishing for Iain Paterson. No use without permission. Dr. Robert Eustace of the Laminitis Clinic in Wiltshire, England has developed a new feed supplement that he believes will be helpful to horses suffering from insulin-resistance and its complications of laminitis. "We are beginning a trial to evaluate the use of a feed supplement to control Metabolic Syndrome / Equine Cushing's Disease. Our preliminary results from animals at the Laminitis Clinic are very encouraging. The trial is conducted through your own veterinary surgeon and poses no risk to your animal. "We pay for the laboratory fees to analyse two sets of blood samples taken, by your vet, at the beginning and end of the trial. We pay for the cost of the supplement during the 28 day trial period. You have to pay your vet's fees to visit and collect the samples. We give you, and your vet, a free gift for participating in the trial. "We will be measuring endogenous ACTH, cortisol, insulin, glucose, NEFA and triglycerides from the samples you submit. These should give us an excellent profile of your animals energy metabolism. "Dependant upon the results of the first blood sample we will let you know whether your animal is eligible for inclusion in the trial. If your animal's results indicate that it is developing Cushing's disease we will contact you and your vet to disucuss your options. "So your first step is to discuss the trial with your veterinary surgeon. If you both agree to participation then please ask your vet to contact us on 01249-890784. We will then send your vet the necessary paperwork." This study is only open to horses in Great Britain.